On Baseball & The Reds: How much has the Reds' slow start cost them? The Reds have gotten off to a bit of a slow start this year, going 3-6, and losing all three of the opening series two games to one. Meanwhile, the Cardinals (who the Reds played 6 times), the Pirates, and the Brewers are all off to good starts. Right now, the Brewers are leading the division, and the Reds are already four games behind them. It's obviously extremely early, and by no means should anyone give up hope on this team--or draw any conclusions about their talent level due to their performance in nine games of the season. But it's not as if going 3-6 and falling four games behind makes no difference at all, either. In my preview of the Reds' season, FanGraphs gave them a 28% of making the playoffs, while Baseball Prospectus had them at 38%. Now, following the first nine games, the Reds' chances have dropped to 16% at FanGraphs (down 13%), and 24% at Baseball Prospectus (also down 13%). That feels like a pretty big drop for a week and a half of games, but it's a consequence of both the Reds' poor performance thus far...and the wins banked by other teams. In the case of FanGraphs, this was also the result of some downgrading of the Reds' projected talent level: FanGraphs dropped the Reds' rest of season winning percentage projection from 0.500 to 0.480. I'm guessing a chunk of that is a decreased playing time projection for Mat Latos. I'm surprised that there's been such a big change in the playoff odds. Floored, really. It's not like the Reds are out of the race, of course, but I'm used to the mindset that a team's record on April 11th is meaningless. And really, it should be meaningless, right? 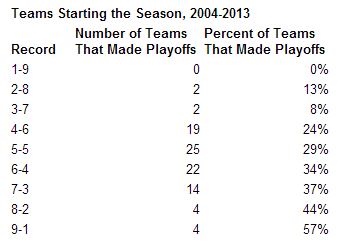 In the middle of the distribution, which is where most teams are, initial record is close to meaningless. But as you look at teams that had either extremely bad (3-7 or worse) or extremely good (8-2 or 9-1) first weeks, you start to see a change in the chances that they make the playoffs. The Reds are teetering right on that edge, with the outcome of tonight's game determining whether they'll be 3-7 or 4-6. These are just historical trends, of course, and are based on pretty small samples at the extremes. It's not like Reds' playoff chances hinge on whether they beat the Rays tonight. And they have lost a lot of close games thus far; their PythagenPat record is 0.437 going into tonight's game, compared to an actual winning percentage of 0.333. So, I'd like to think they're a better team than they've shown. One more take. Let's say the Reds are a true-talent 87-win team. That's a 0.537 winning percentage. Then, they start 3-6, because it's baseball. Over the remaining 153 games, then, they should win 0.537*153=82 wins, making for 85 total wins on the year. So yeah, it's really just two wins. The problem is, with the Reds being a marginal playoff team as it is, a few games back in the loss column makes a big difference in the likelihood that they can get their way into a playoff slot. I'm definitely not giving up, obviously (despite Jim Day saying scary things about Mat Latos's arm). The Reds need only go on one good winning streak to make up this first 9 games. Every game does count, but there are major ups and downs in any baseball season. Let's just hope that these first three series have been one of the bigger downs for the 2014 Reds.